Each spring I get hundreds of emails like Lauren’s. Perhaps you’re suffering from water pouring or seeping into your basement or crawlspace. Maybe you’ve got a soggy yard that’s more like a swamp than a lawn. Yes, I’ve solved tens of thousands of wet basement problems. I have my college geology degree to thank for that! I had a focus on hydrogeology which is the study of groundwater and how it moves. 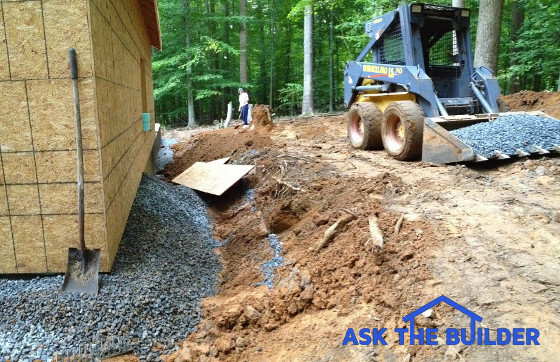 It’s important to realize the best way, in my opinion, to solve leaking basements, crawlspaces, and soggy soil is to install a linear french drain. This is a simple trench drain in your yard that intercepts the water moving sideways through the soil towards your home. A perforated pipe at the bottom of the narrow trench captures the water and redirects it to the lowest spot on your property. This trench should be placed about six feet away from your foundation and be on the high side of the land that’s sloping towards your home. The trench may be L or U-shaped as it protects your home. It depends on the direction of the overall slope of the land on your lot. Eventually, the trench daylights on the low spot of your land and the groundwater flows out of the pipe only to re-enter the soil on its journey back to the ocean or sea. The trench only has to be 24 inches deep in most cases because a majority of the water movement through soil is in the top 12 inches where there’s lots of air. I prefer the solid plastic pipe that has two, or three, rows of holes drilled in it. The holes always must aim down in the 4 and 7-o’clock position. Never ever put a sock on the pipe or filter fabric in the trench. Neither are required because silt doesn’t move through the soil. If it did, then spring water would be muddy all the time. The trench gets filled with rounded, or slightly angular, gravel that’s the size of large grapes. Water moving through the soil encounters the gravel, falls down to the perforated pipe and uses the pipe to bypass your home. I’ve created a FREE downloadable document for you at my website that has a 3-D drawing of this trench drain. The document contains homeowner testimonials about how well these drains work and many other installation tips. Just click on: B1243 to get the free PDF document. As you might suspect, I get lots of email like Patrick’s. It even gets hot as blue blazes here some days where I live in NH. I took an infrared image of my own roof three years ago and the surface temperature of the roof was 155 F! The truth is ridge vents do little, or nothing, to lower the temperature of the inside of an attic. In fact, they would have to break the laws of physics to work. Hot air rises, it doesn’t go down. To exit a roof ridge vent, air has to go down about three inches. I’ve experimented with a stick of burning incense in my own attic during the hottest part of the day and the smoke incense just collects at the ridge and doesn’t go out the vents. When the roofing material gets hot, it transfers the heat to the roof wood sheathing and framing. The roofing and framing materials radiate this heat like the hot coals of a dying campfire. It can do this for many hours after sunset. It’s simple physics. To cool an attic space, you need to do what chicken farmers do. You must send vast amounts of air through the attic space using powerful fans. Tens of thousands of cubic feet per minute of air must move through the attic to try to lower the temperature from 160 F to possibly 110 F or less. You’ll never get the attic temperature lower than the air temperature outside. I’ve created a FREE downloadable document for you at my website that has a list of the fans I’d consider putting in my own attic. The document also contains the thermal image of my roof as well as other tips on how to lower your attic temperature as much as possible to keep AC bills to a minimum. Just click on: B1243 to get the free PDF document. I've read your document (B1243) and was wondering if you had a fan recommendation for homes with a hip roof that has no vertical location to install the Broan 356BR1600. I am planning some major roof work to extend my overhand and add soffit ventilation (I currently have no attic ventilation for my 1948 home) and want to add a fan to improve airflow on hot summer days.